When I posted the recipe for Salad Olivieh, one of the regular readers Eric asked if there was a difference between regular dill pickles and Persian pickles. This is the best time for me to post about what we Persian refer to as Khiar Shoor, which translated means salty cucumber. I personally love Khiar Shoor and I can honestly say that I am not a fan of the regular pickled cucumbers found in stores or delis in the US. The type and size of cucumbers used are different. But also the flavor is nothing like Khiar Shoor to me. More than anything, I don’t like the hint of sweetness that some have. I know, I am a bit snooty about my pickled cucumber type. The three samples above are my favorites. The glass jar on the right is by Sadaf and the cucumbers are small. The cucumbers are pickled in vinegar and are spicy. They are simply named Khiar Shoor Irani, which means Iranian Pickled Cucumber. The two jars on the right on the other hand are respectively by Golchin and Mid East. They have bigger cucumbers and are pickled in brine with garlic and spices. However, they are not spicy like those in the glass jar. …cucumbers in brine with dill. These are good too. I am not a fan of the vinegar pickled type, but the one in brine with dill is good! Here is a photo of the pickled cucumbers outside of their jars. The small ones are often found on a Persian lunch or dinner table along with Torshi, Persian vegetable pickles. The bigger ones are usually used for Salad Olivieh as well as in sandwiches. The larger cucumbers are generally cut in three different ways; either in rounds, at an angle, or length wise. 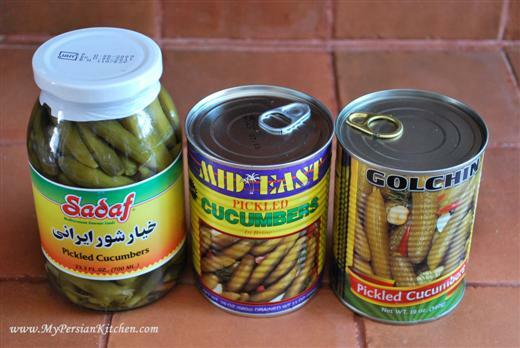 Interestingly, while us Persians refer to this specific type of pickled cucumbers as Iranian or Persian, they are actually not grown in Iran. They are all products of Israel and frankly, they are the best tasting ones in my humble opinion! How do you like your pickled cucumbers? Here we can get pickles in brine with tarragon and they call them Shirazi. They aren’t what I want, though. What I really want is good torshi like I was able to get in Chicago. And I haven’t had any decent pickled garlic since coming to Texas either. Actually, salty cucumbers are not even Persian specific. In Poland, we usually make it at home in summer. There is some difference in taste, we add garlic and dill, but we use mature plants, with flowers. We also use a little bit different species of cucumbers. They are shorter, thicker and should be as small as possible to be tasty. Actually, none of the pickle brands you have shown taste anything like the ones in Iran. The closest to the ones in Iran I’ve found was a Polish brand which I had bought in San Diego. The store never carried it again. I’ve looked in every ethnic store in Tucson for it and have not been able to find it. I do not remember the brand. Perhaps someone reading this will know it. Those pictures are mouth-watering! I have been desperately looking for torshi here in Belgium and the closest taste to my Mum’s torshi were either the Lebanese cucumbers in brine or indeed the Polish brine-pickled ones (but as Mirosix says, they are indeed much chunkier). I would love to see you post a recipe on how to make them from scratch. PS: keep up the good work, your blog is great! new website? i love it- congrats! Great post, I NEED these pickles. Not a fan of sweet ones either. Just found your site! I grew up in the states but spent two of the best years of my life in Iran as a child. The memories of the beauty of it and the food are a big part of my life now. My husband and oldest daughter love the Sadaf brand pickles…and will eat the entire jar in one sitting. I have just found they get a little soggy once if you don’t eat them pretty quickly. Lori Lynn, you can get these at Hawthorne International market on Hawthorne Blvd and PCH. The store is on the south side of Hawthorne just above PCH. Alise, welcome! Thank you for your kind words. Yes, the ones in the jar do get soggy after a few days. But the smalls ones keep well. We can buy very tastey salty pickled cucumbers here (I live in spain) that come from poland.. They are also not hard to make if you can find the right kind of cucumber. I love them all but my favourite is the shoor. I alos make my own seer torshi -salty pickled garlic! YUM! 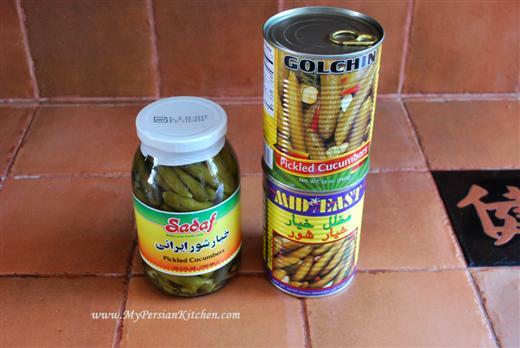 i would like to know where to purchase the persian pickles in up state n.y. ? Darryl, I don’t live in New York so I honestly don’t know. But you may want to look for Persian stores in your area. 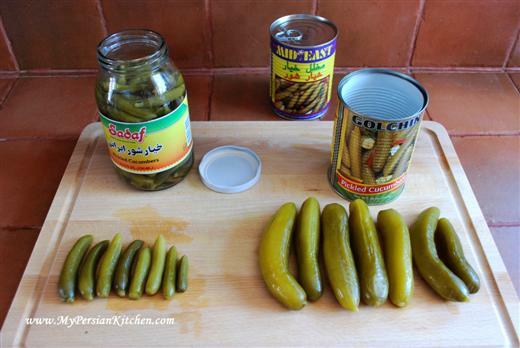 Do you have a recipe for creating your own Persian Pickles? My partner is like you and he doesn’t like the sweet or dill ones sold here (Canada). Making our own pickles would be something fun for us to do together, especially as it’s hard for us to find them where we live right now. We also like the Sadaf brand as well as 1&1. Take care! For Minou in Tucson, a fairly new Persian market called “Babylon Market” on Alvernon & Speedway caries Persian Pickles for making Salad Olivieh. Of course there is always the internet, or if you know somebody in Semi valley, CA the Woodland Hills Market (19964 Ventura Blvd Woodland Hills, CA 91364) also sells various brands of Persian pickles. I lived in Iran for 7 years, ohhhhh so many memories, partidularly the food. I still cook it at least 3 times a week. My now american husband loves it. Today is Ghaseem badem june….We ate this only at the Caspian and I did pay attention to the cook – she had a two burner propane countertop grill. She generally started about 1:00 in the afternoon roasting the eggplant over the burners…then starting with onion, garlic and tumeric, she cooked them and then chopped the eggplant and several fresh tomatoes and let it stew for about an hour, she then added full eggs to the center and slowly cooked them, leaving the yokes soft, served with lavish and all the condiments. Ohhhhhhhhhhh how delicious. The reason it was only eaten at the Caspian is because of the garlic. When the humidity is high the garlic doesn’t come out in the breath. However, in Tehran, where it was dry and it would be “unsocial” to eat garlic, because it was more noticable. great site…do you know once the pickles have been opened from the can do they need to be kept in the fridge or can be left out in a cool cabinet? Dave, they should be kept in the fridge in their own juice. 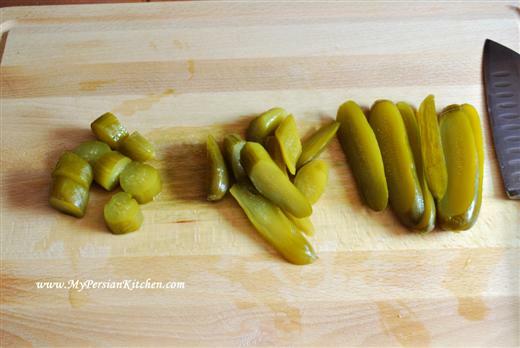 Do you have a recipe on how to make your own pickled persian cucumber? Bea, I have been working on that recipe and have not been happy with the result to post.